Other posts on this topic: I Have a Card Catalog Cabinet, Refinishing a Card Catalog Pt. 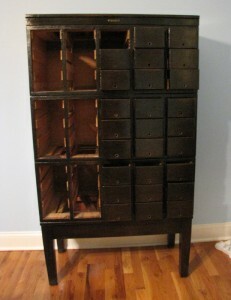 1, Refinishing a Card Catalog Pt. 2, Refinishing a Card Catalog Pt. 3. The card catalog is sealed and in the dining room! It also…really looks like an antique next to all of our new, modern dining room furniture. I have to make some moves in that room so it doesn’t look like this sad, discarded old relative in the corner that can’t keep up with all the young whippersnappers.